Ah yes! What a morning; waking up to this stunning view from our room … clouds reflected in a glassy sea inside a sheltered cove. Not a bad start to a day! And now we were up to Day 3 of our expedition exploring the islands and coves of Alaska’s Inside Passage aboard National Geographic/ Lindblad’s ship, “Sea Lion”. But where exactly were we? 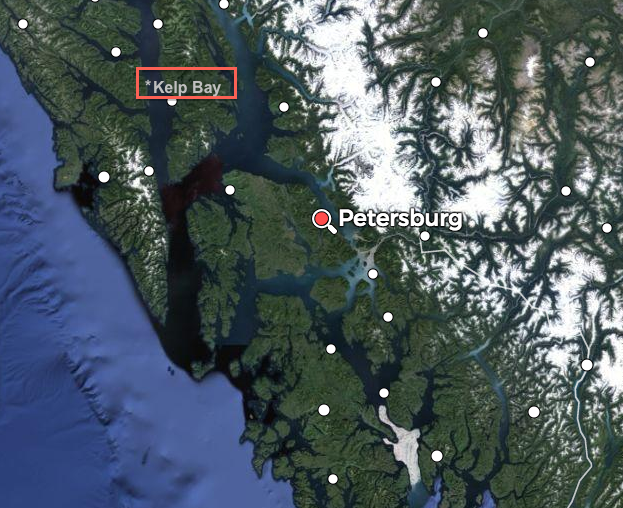 Overnight we’d sailed, from Petersburg, north back up Frederick Sound, past where we had seen all those whales, turned west at Five Finger Lighthouse and sailed down the main shipping channel until we could turn north into Chatham Straight and on to Kelp Bay. 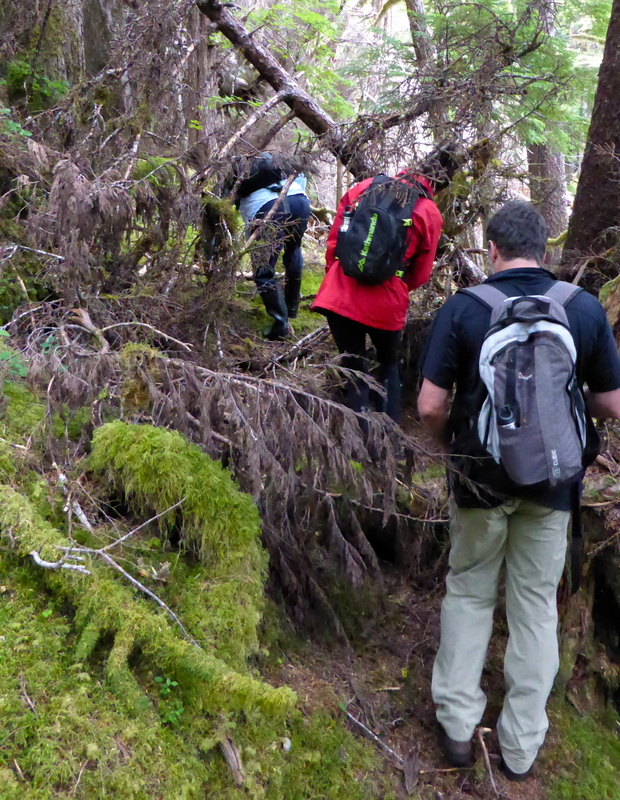 We were still within the wilderness of the immense Tongass National Park. 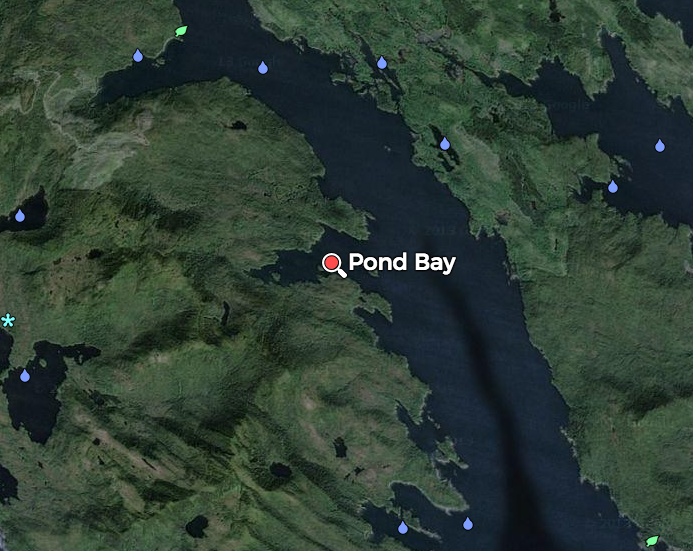 Our activities for the morning would centre around Pond Island Bay. This was the first day for kayaking and there were many excited people on board just waiting to explore the shore line on their own in a kayak. I had chosen to explore a little further afield by inflatable DIB and David had chosen to do another forest walk. Before anyone could take part in any of these activities, the kayaks had to be lowered from the roof and taken ashore. David’s walking group, taken by Lee, was the first to go ashore. That’s David in the blue jacket with his trusty brown backpack at the ready. this was the usual style of wet landing in icy waters on a pebbly shore. David’s walk was yet another walk and plant hunt in Tongass National Forest, the forest area that we had been exploring ever since we left Juneau. 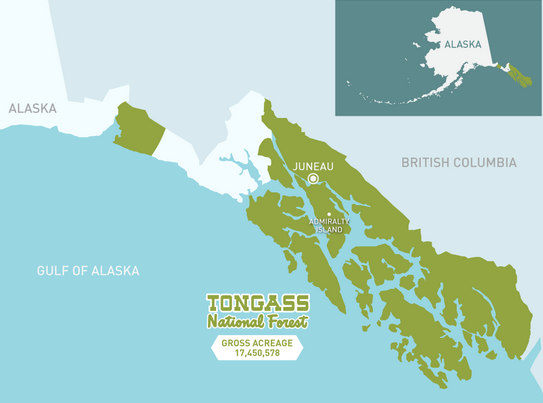 Established by President Theodore Roosevelt in 1907, Tongass is the largest National Forest in the USA. It covers approximately 80% of Southeast Alaska; 69,000 square kilometres, or almost seventeen and a half million acres, and it encompasses more than 5,000 islands and more than 16,000 miles of shoreline. In fact, it covers all of the area known as the Inside Passage except for the Glacier Bay National Park (which is the large white area just west of Juneau on the map). The Tongass is part of the world’s largest remaining coastal temperate rainforest even though, during the past century, substantial portions of the large tree, old-growth forest have been harvested. There is much discussion today about how to protect and conserve the remaining high-value forest; high value for the environment and all the wildlife within the the forest and its waters, but also high value timber for the foresting industry. As we have seen on David’s other forest walks, shelf fungus is not hard to find. Wherever there’s debris from logging, or just from trees falling after big wind storms as happened here, mosses grow and, with them, fungi. This fungi, which forms quite a sculptural group, was missed by most of the walking group. Fortunately for those of us doing an armchair walk with David, he is very observant. People who actually walk with him are often amazed at what he sees, and photographs. One very small, strange looking plant that David saw, but most others missed, was growing down in the mosses. This plant is commonly known as Pinesap, and that maybe because it’s a saprophyte which ‘saps’ the juices of its host, in this case the pines under which it grows. It’s scientific name is Hypopitys monotropa from the Greek hypos, meaning beneath, and pitys meaning tree. 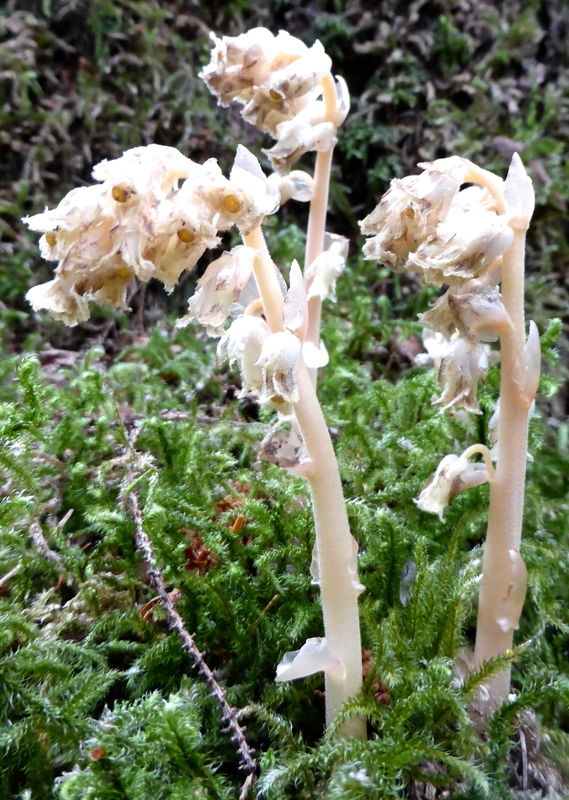 That all makes sense; but what about monotropa? That refers to the flowers which all face one way; and they do. Here at Pond Island, many trees were unfortunately uprooted in a large windstorm. This is a natural phenomenon in forests. But in other parts of the Tongass, there has been a great deal of logging done over many years and the status of the Tongass will be degraded if logging continues unabated. So what are the pros and cons in the discussion about old-growth vs. second-growth? Our naturalists gave this answer. In old-growth forests, uneven aged trees provide a broken, patchy canopy that permits sunlight to penetrate and support a healthy plant community on the forest floor. Any old-growth forests sustains the health of watersheds and aquatic systems, regulates water temperature and moderates flooding. Here in Alaska, this healthy water creates habitat for fish and wildlife. The high quality water habitat supports many fish such as the five kinds of salmon, the mainstay of the local fishing industry. It also provides a healthy environment for harbour seals and sea birds as well as a high quality land habitat for brown bear, black bear, wolves, deer and squirrels to name a few of the forest dwellers. Dozens of bird species are also associated with old-growth forest habitats, including Bald Eagle and Northern Goshawk. Other birds such as woodpeckers,Marbled Murrelets and Brown Creepers nest in old growth tree cavities. On the other hand, after harvesting old growth forest, the area is replaced by a dense even-aged stand that inhibits sunlight and thus understory growth, resulting in relatively sterile habitat that will not support many of these species. To log or not to log old growth? To me it’s what is known as a “no brainer”! And while we are talking about the need for old growth forests for forest dwellers… this cute squirrel is one of them. In spring, squirrels feast on the new tender buds of spruce, hemlock and alder. As is the case with all squirrels, they also feed on seeds and nuts. In autumn, they ‘squirrel’ away cones and seeds in chambers in their tunnels or in their forest floor middens. 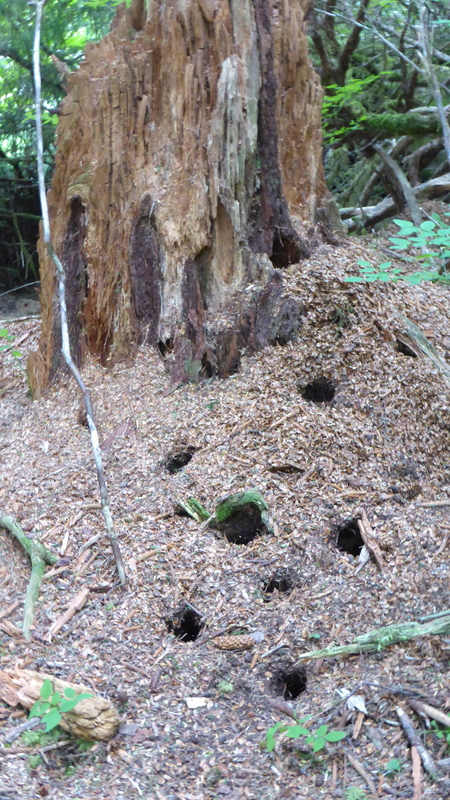 The midden is covered in holes where a squirrel has been busy planting its food treasures. Not all squirrels have tunnels; some make nests in the trees or in holes in old growth trees. Although seeds and nuts are their main food source, squirrels also cut off fungi and take them up into trees to lodge in crotches of branches to eat later. Within these forests, as we have seen on these walks with David, there is a wide diversity of vegetation types, ranging from lichens, mosses, liverworts, and ferns to flowering plants and shrubs to large trees that can be centuries old; some more than one thousand years old. We hope it remains so always for many more people like us to enjoy; and, more importantly, for all of the birds, flora, fauna and fish that are dependent on it for their well being; and for the health of the air that we all breathe. 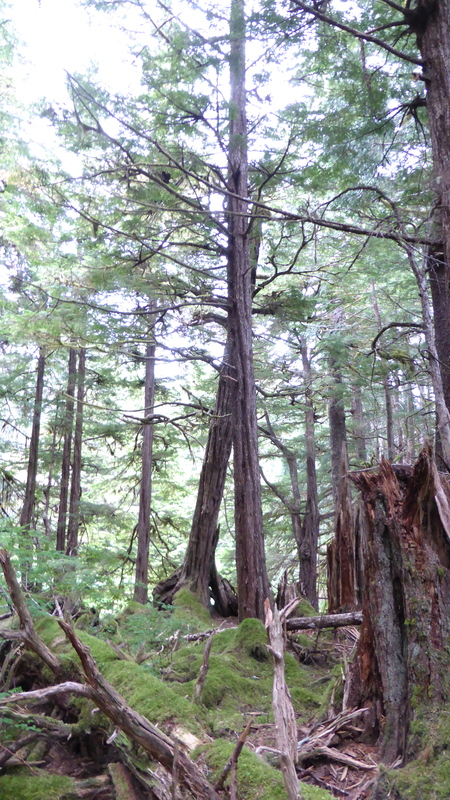 Tongass National Forest is made up mainly of Conifers, cone-bearing trees such as hemlock, and spruce, cedar and shore pine with Alder on the forest edges. But two trees are the most abundant; Western Hemlock, 70%, and Sitka Spruce, 20%. So what’s the difference? The leaves of the Western Hemlock, Tsuga heterophylla, are are blunt-tipped, soft, shiny, and flat unlike the sharp needles of the spruce. Hemlock leaves are light green to medium green on top, with two whitish parallel lines beneath. They grow from two sides of branch, parallel to the ground. The cones of the Western hemlock are brown, oval-shaped, about 3 cm (1 inch) long and have thin, papery scales. They hang down at end of twig. These hemlocks can grow to between 45 and 60 meters in height (100 to 150 feet) and .6 to 1.2 meters (2 to 4 ft) in diameter. If left unlogged, they can live anywhere from 200 to 500 years. The cones of the Sitka Spruce, Picea sitchensis, are quite different; they are the usual conifer cone shape that most of us are familiar with. They are light orange-brown, usually found in the top quarter of tree, hanging down from branches, with papery scales. The sharp needle like leaves of the spruce are dark green and grow on all sides of branches from woody pegs. This is a characteristic common only to spruce. These trees may live between 500 and 700 years; some have been known to be 1,000 years old. At maturity they reach between 46 to 67 meters (150 to 225 feet) in height and 1.5 to 2.5 meters (5 to 8 feet) in diameter. This part of the walk is quite a mess after the storm. it was for the fit and adventurous; not for the faint of heart! While scrambling through the forest, David found a rather lovely saprophytic orchid, known as Coralroot, Corallorhiza maculata ssp. maculata. It’s similar to the white-lipped Corallorhiza maculata but this one has magenta spots on its lip, hence the variation in name. These orchids derive their nutrients from the decaying matter in the rich humus of moist coniferous forests such as this one. Because they don’t need to make their own food, they lack the green colouring of most plants. The Red Alder, Alnus rubra, is usually found on the edges of the forest and is quite different from either the spruce or the hemlock. It’s a fast growing deciduous tree that only lives for about 50 years. It helps to fix nitrogen into the soil and thus helps smaller plants to grow on the outer edges of the forest. The cones of the Red alder are small, hang down in clusters and they stay on the trees during winter. The cones contain winged nutlets that the squirrels enjoy. Red alder wood is considered by many to be the best wood for smoking salmon and other kinds of fish; another reason for it to be logged. The wood is soft and is used for carving items such as feast bowls and masks. The red bark makes a red or orange dye; the differences in colour can be attributed to either the age of the bark or the addition of substances like urine! Finally, David and his fellow walkers emerged from the forest. They looked out into the bay where the kayakers were still having fun and where I was exploring the water’s edges in a DIB. More of that anon.